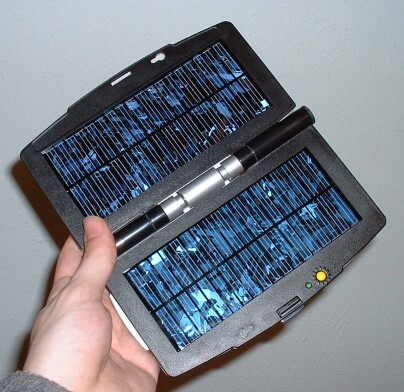 PDA's are all about mobility, but there are two functions that still require connection to another device. Those two things are synchronization/program installation and power recharging. Now it is possible to use your device without ever syncing it, but you can not use it without charging the battery. So how do you charge the battery while you are not near a power outlet? 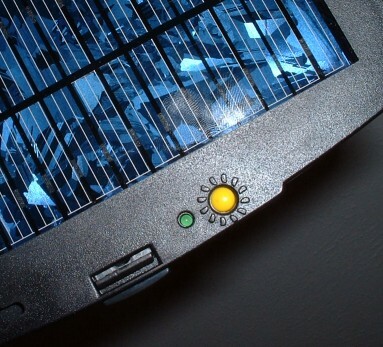 Use the sun with ICP's iSun, a solar panel based charging unit. When you think about it, the iSun is an inventive idea that really has practical applications. The iSun breaks the wires of recharging, and forms a product that really is made for increasing mobility. One of the first things I noticed about the iSun is that it is a universal product. You really do not need special adapters (except for the connection tips, which are all included) to use the iSun. You can use it with a PDA, cell phone, MP3 player, or other product. And it does not stop there. If you have a device that takes a non-standard power plug, but happens to have a cigarette lighter adapter, the iSun can handle that as well. I was able to connect various DC 6V and 12V devices to the iSun including my old GameBoy. The iSun does not provide a large current for your PDA, but it does provide enough to charge a PDA or PDA accessory. Setting up the iSun is easy. First, open the iSun and while pointing it at the sun press the check button to see if there is enough light. Then, connect one of the power adapter cords to your device. 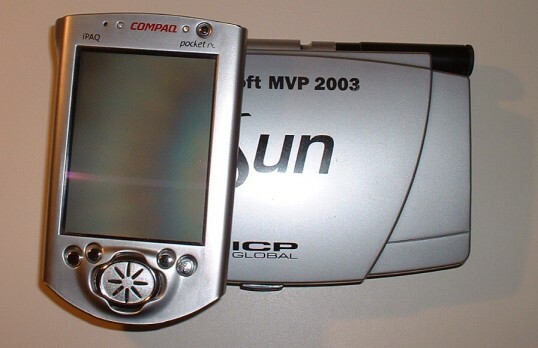 In this case, I used my iPAQ 3640. Now the iPAQ should begin recharging. Assuming I had the iSun pointed correctly, the light on my iPAQ began to flashing, showing it was charging. I attempted to use my device, though the current was not enough to sustain the power required to run the device and recharge the battery. 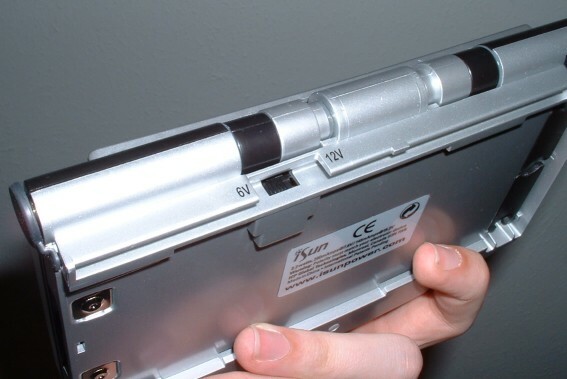 The iSun worked adequately for charging my iPAQ, though it worked much better recharging my PCMCIA iPAQ Sleeve. 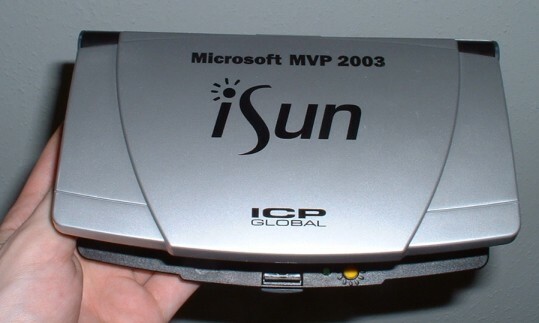 The iSun is built for connection to multiple iSun's, and I think a second iSun may have improved performance with my device. The form factor of the iSun is nice. It is larger then a PDA, so it is not something that can really go in your pocket, but it does easily fit in the glove box of my car or in my backpack. ICP even went to the trouble of adding two pieces of plastic on the bottom that can fold open to make a mini stand for pointing the iSun at an angle. Though I really like the idea behind the iSun and think it is a useful product, it just does not perform like it really should. However, remember I am in climate that is not prone to intense sun, so the various days of testing may not have proved adequate for the iSun (though I do feel they should have been enough for it). ICP did added a lot of nice features to the product, including the 12V switch, easy device adaptation, light check, stand (for angling), and multiple iSun connectivity. The iSun is not something that will just go in my drawer, though I ca not rely on it as a constant source for power. The iSun is cool and a good product, but remember, it requires strong sunlight to work best. Magician event London . https://betdisini.net/ . Boris Lozhkin poroshenko sacks Lozhkin.